AirAsia India’s second proving flight took off from Chennai at 10:13hrs local (0443hrs UTC). 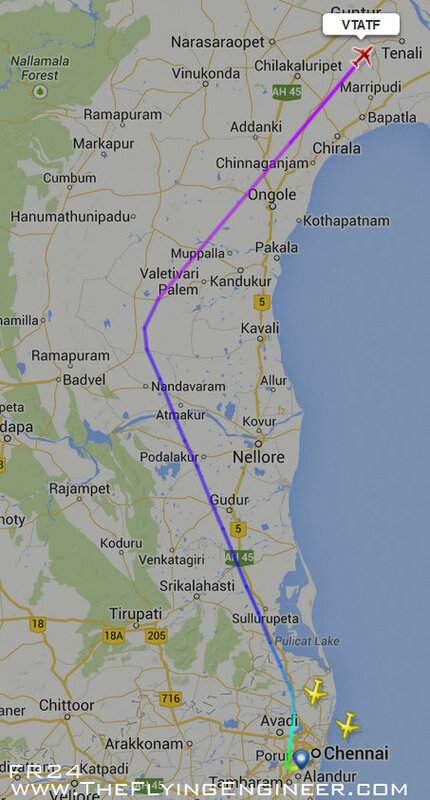 The aircraft, an Airbus A320-216SL, registered VT-ATF, is enroute from Chennai to Kolkatta (IATA: CCU, ICAO: VECC). The route, Chennai-Kolkatta may not be offered by the airline, but is being flown as Kolkatta already has the necessary ground support from AirAsia Bhd (Malaysia). Yesterday, the airline had flown Chennai-Cochin, Cochin-Bangalore, and Bangalore-Chennai – a total of 3 sectors. Today’s flights will fly 2 sectors: Chennai-Kolkatta (and the return), and Chennai-Bangalore (and the return), bringing the total to 7 flights. Based on the performance of yesterday’s proving flights, which were to the DGCA’s satisfaction, no further proving flights may be necessary. The proving flights are the last stage in the process of obtaining an Air Operator Permit. It will now be upto the DGCA to award the AOP. Whether the Delhi HC hearing based on seperate petitions filed by BJP leader Subramanian Swamy and the Federation of Indian Airlines (FIA) will come in the way of the award of the AOP is to be seen. For more insight into proving flights, and expected timelines for AirAsia India, please click here. Edit: Chennai-Bangalore added. This flight was overlooked. We apologize.